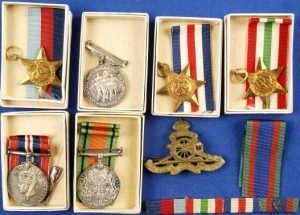 Here at JB Military Antiques we buy and sell orders of chivalry (Royal Orders), orders of gallantry, military campaign medals, long service and good conduct medals, jubilee and royal period medals as well as other assorted military related items of ephemera. 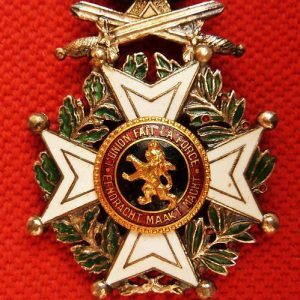 The collecting of military medals and orders is by far the most popular and most prolific item that can be obtained by the collector. Depending on the award criteria and the numbers awarded, prices can vary from as little as $10 for a basic US Defense medal issued for basic training completion up to the covetted Victoria Cross, which, depending on the country of origina of the recipient can set you back between $150,000 and all the way up to $1 million. 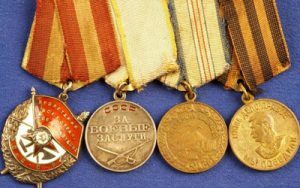 Many collectors can often be bamboozled by the prices of medals from various countries and regions. The price of medals will depend on many factors, not least the availability and issue numbers and also condition. 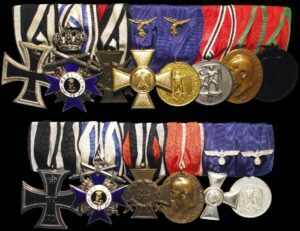 As a rule of thumb, German WW2 medals attract considerably higher prices than many of the other combattant countries medals, with the exception of the various gallantry orders. Make sure when viewing items you ask about conditions relating to the item, such as wear and polishing, naming, knocks and damage, as well as any history relating to it. 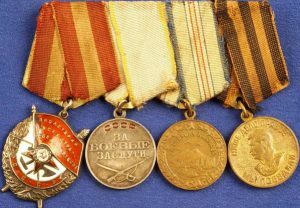 Medals can be found as ‘singles’ or as mounted sets. Singles are as the name suggests, medals that are presented by themselves. Whilst WW1 and WW2 recipients will always be entitled to more than 1 service medal, other campaigners could well have received just 1 medal in their career, so make sure you do your research on the recipient or on the medal. Mounted sets will usually have been worn byt he recipient on their uniform or civilian clothes. Medals are mounted from left to right (as they are viewed) based on their relative importance, with royal and gallantry orders presented first, followed by campaign and service medals. My advice to any collector of medals is to do your research on the medal you are about to purchase in order to gain an idea about its value and price and also what you should expect in terms of presentation. Medals are heavily reproduced and copied, so be mindful of price and always ask for a guarantee of authenticity. Price cannot always determine quality and honesty, so if you are doubtful about an item, either don’t buy it on the spot or have a medal dealer examine it.